Posted on Thu, Mar 18, 2010 : 2:22 p.m.
Why is massage therapy, or flexibility training so important to sport performance? When muscles are too tight they don’t have the flexibility to give you their full strength and your range of motion is limited by that tightness. This puts you at risk for injury in the form of muscles pulls or tears. And, over time, limited flexibility can lead to postural imbalance and chronic pain. Having worked with a number of athletes, young and old, the feedback I receive from them is that massage before an event allows them to perform at their maximum capacity. In the case of a couple of young swimmers I have worked with, they believe it helped by shaving time off of their events, allowing them to move forward to the next level. In top level competition seconds can make the difference of whether you make the cut to move on in your event. Proper stretching may be all that you need. Your first step will be to find stretches that will address your areas of tightness. Some good resources for stretching include books on stretching and the Internet. The Internet has many great exercise sites that have stretching resources (www.exrx.net is just one) as well as YouTube, where the videos are sometimes easier to follow than a picture in a book. Once you have found the stretches, the next thing to do is to fit them into your schedule. Remember to do something to warm your muscles up before you stretch them. Doing some active joint mobilization (moving the arms/legs at the joints, etc), jogging in place, or even a hot shower will work. Then move into doing your stretches. 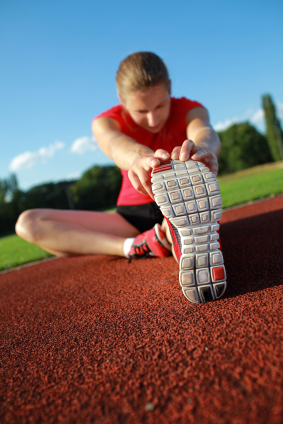 There are different theories about how long to hold a stretch to achieve maximum length in the muscle. You may decide to perform the stretch once and hold it for 20 to 30 seconds, this is called a static stretch. Or you may prefer to do an active stretch where you move into the stretch, hold for two to three seconds, and then release the stretch, but perform the movement ten or fifteen times. And remember to ALWAYS stretch after a practice or a workout. Ideally, this is the best time since your muscles are very warm and respond well to the release a stretch offers. This can also cut down on the soreness you may experience after a good workout. If you find that stretching itself isn’t enough, you may want to make an appointment with a massage therapist who specializes in sports massage, deep tissue work, also known as neuromuscular therapy and myofascial therapy and/or some kind of Repetitive Use Injury Therapy. Sometimes a session with a professional who will work out the tightness and adhesions in the muscles will be just what you need to get your own stretching routine started. For your sports performance and the health of your muscles, make sure you put as much time into your flexibility routine as you do into perfecting your sport. Tue, Mar 23, 2010 : 11:59 a.m.
Wow, AnnArbor.com. "...its Maximum Level"
Fri, Mar 19, 2010 : 2:55 p.m.